Casanova may be kind of shy when you first meet him but once he warms up to you he wants to always be at your side. He’s come a long way but he still can be wary of new people and dislikes being restrained. Recently he’s started coming to the couch for cuddles and attention so we think he’ll adapt to being a pampered pug. Casanova is pretty much housebroken aside from some minor marking issues but it has become less frequent. He sleeps in bed but he has no problem going to his crate when we’re getting ready to leave the house. He loves chews and treats and is very enthusiastic when it’s feeding time. He’s had no problems with our house full of cats and dogs but we haven’t tried him with kids. He may not be the best for small children since he can still be a little skittish. Interested in adopting Casanova? 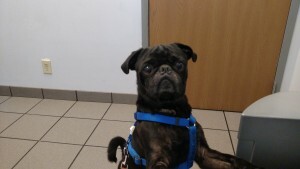 Please see our website and fill out an application at: www.pugpartners.com/adoption-application Casanova’s minimum adoption donation is $325.